Hiraizumi (平泉) is registered UNESCO world heritage site located in Iwate prefecture. It was registered in June 2011 as "Hiraizumi - Temples, Gardens and Archaeological Sites Representing the Buddhist Pure Land." There are many beautiful temples such as Chusonji and Motsuji, gardens and historical sites. Hiraizumi is also Minamoto no Yoshitsune related spots. He was grown up at Hiraizumi and died at Hiraizumi. His soul rests in Hiraizumi. To visit all spots. MLJ recommend to use a rent-a-bycile. You can get it at the station. 1000 yen for one day. You can get a map, too. when Fujiwara no Kiyohira settled principal images here in eary 12th century. Kiyohira, the first lord of Oshu Fujiwara clan, built Chusonji for Buddhist Pure Land. Today, it is the most popular site in Hiraizumi and one of UNESCO world heritage sites. There are many beautiful temples and it has great harmony with nature. Konjikido, literary means golden temple, is the only remaining building which exists since the time of Oshu Fujiwara clan in Hiraizumi. Motsuji Temple (毛越寺) and its garden are important historical site of Hiraizumi. They are registered as UNESCO World Heritage Site in June 2011. Motsuji Temple was established by Motohira, the 2nd lord of Fujiwara. It was originally established by Priest Jigaku in 850, but it was lost later. Motohira, restored in early 12th century. When the famous poet Matsuo Basho visited this garden, he wrote one of the famous his poem. 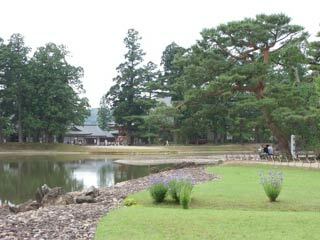 The garden of Kanjizaioin Temple (旧観自在王院庭園) is one of UNESCO world heritage sites of Hiraizumi. It was built by the wife of Fujiwara no Motohira. It is also designated as national landscape of Japan. The temples were lost in long time ago, but the beautiful gardens remains as beautiful as it was built in 12th century. Mt. Kinkei (金鶏山) is a 98.6m tall mountain located in Hiraizumi. This site is registered as UNESCO world heritage site of Hiraizumi. Kinkei literary means golden chicken. Legend said, Fujiwara no Hidehira made an artificial mountain imitated Mt. Fuji, and　buried golden chicken on this mountain. Because from the view of Muryokoin, sunset happens at the top of Mt. Kinkei, this mountain represent the western pure land. The grave of Yoshitsune and his wife: located at the entrance of Mt. Kinkei. The grave of Benkei: located at the entrance of Chusonji. Takadachi Yoshitsunedo: where the house of Yoshitsune was located and his last place.